Barbecue University—the incredible hands-on grilling class founded and hosted by Steven Raichlen to share his grilling and barbecue expertise—is just around the corner. One of our favorite springtime tasks is developing the menus. Since 2001, thousands of students have attended these three-day sessions, many traveling thousands of miles to learn the secrets of live-fire cooking from one of the world’s foremost authorities. Hosted by the luxurious Forbes 5-star Broadmoor resort in Colorado Springs, Colorado, students have come from as far as Dubai, Australia, Germany, and other countries. Much planning goes into the menus. On a typical day, students master eight dishes, from appetizers to desserts (and sometimes, cocktails)—often more as Steven creates spontaneous “extra credit” recipes. Each is selected to illustrate a particular cooking technique or showcase one of the forty-plus grills and smokers in the BBQ U arsenal of equipment. Students, no matter what their skill level at the beginning of class, come away with a rich understanding of the five methods of live-fire cooking—lessons that will change their outdoor cooking forever. This year’s menus come from Steven’s new book, Project Fire (you can pre-order it in advance of its April release). In the meantime, we thought we’d share some of our favorite recipes from previous years. 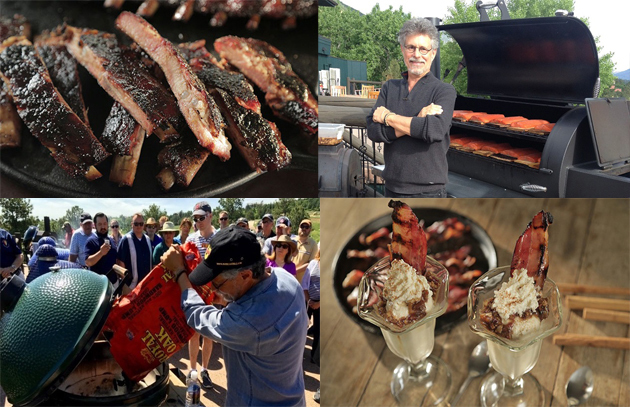 The May 25 session is sold out, but a few seats remain for the May 27–29 session of Barbecue University with Steven Raichlen. Click here for more information. It promises to be an experience of a lifetime.